Today is the last lunch of the school year. Everyone, were you able to eat at least a little of bit of even foods you hate? Looking back over the year, try looking for areas in which you have grown! Today is the last day of the school year. For that reason I didn’t eat school lunch. I considered posting a picture of the bento I brought instead, but given that it was nearly exactly what I ate last Monday, I thought this picture of sweet Spring sake I drank the other day was nicer. 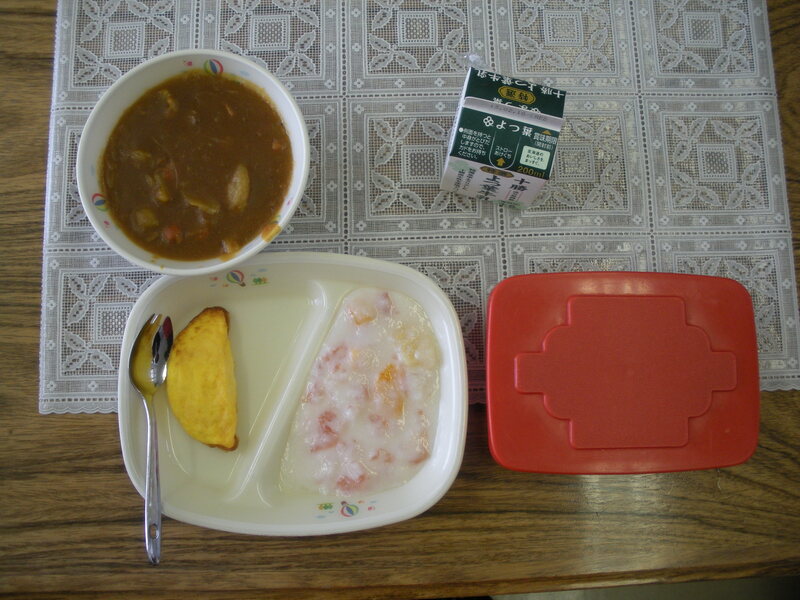 I started this blog a year ago with the goal of translating with photographs the school lunch I ate everyday for a full year. I have learned a lot through thinking about and eating school lunch: trying new foods, considering the implications of my food choices, and developing new likes! I hope my dear readers could enjoy seeing a little bit of my daily life and reading my ramblings about school life in Japan. Posting nearly everyday was a difficult task though, with a busy schedule, so while I will still be eating school lunch next year, I won’t continue posting everyday. However, I wonder is there anything you would like to read about or see pictures of relating to food and Japan? 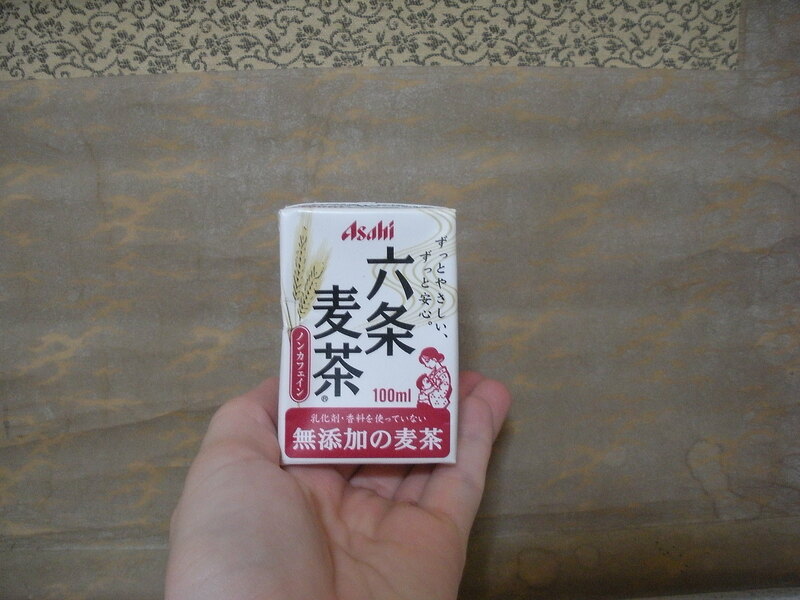 It is said “For scent, Pine Mushrooms; for taste, Shimeji”. Very few shimeji mushrooms have a poor taste. Because they are so tasty, they are used in many kinds of dishes. 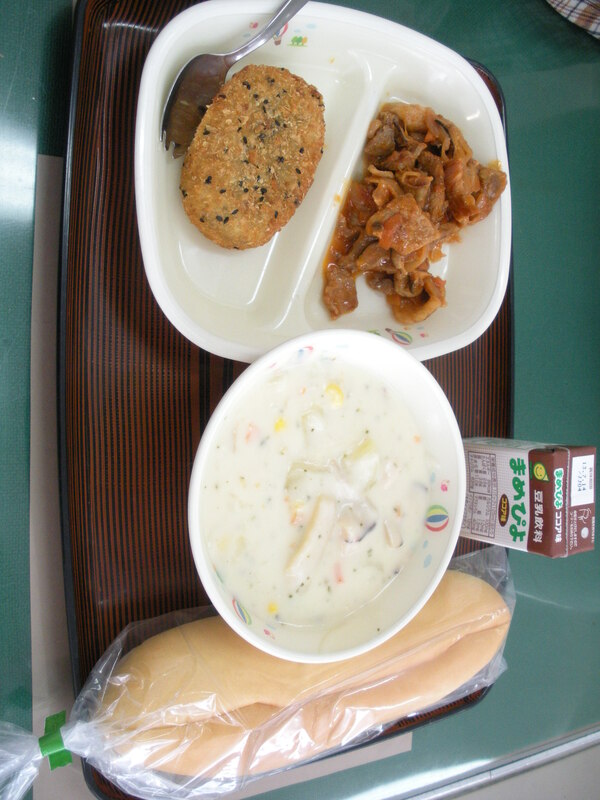 I didn’t eat school lunch today, due to the graduation ceremony. I’ve mentioned this before, but with every school lunch, milk is served. However, and I think this only started a couple years ago, a student’s parents can request wheat tea (mugicha) in place of milk, if the student has some intolerance to milk. A week or two ago, there was such a student absent due to the flu, so the students in charge of lunch that day gave his mugicha to me! You can see it is pretty small, only 100 mililiters, and of course unsweetened and without any additives. 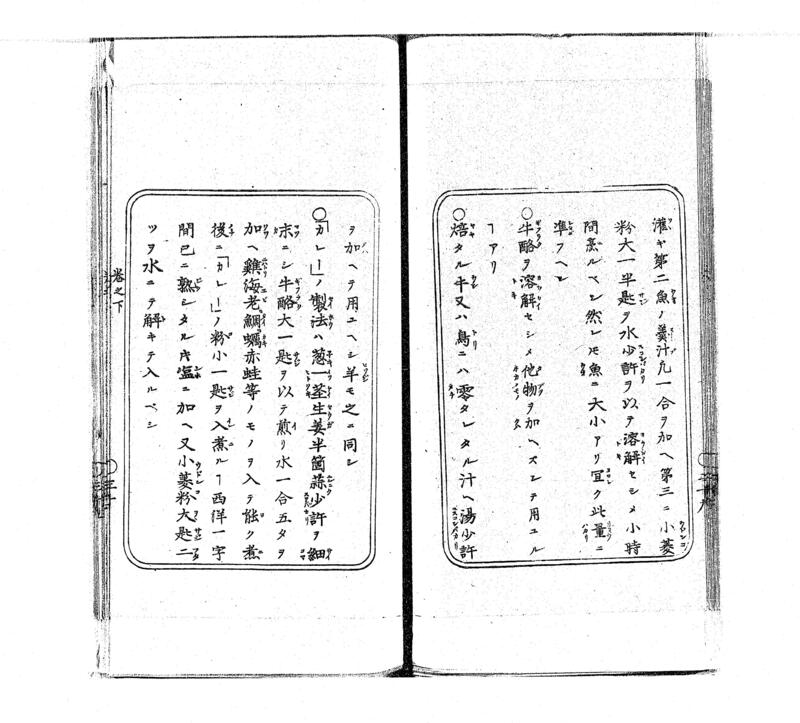 On the front is a woodcut picture of a mommy in kimono nursing her baby boy. I suppose the idea is that mugicha is as nourishing as mother’s milk? Also, mugicha has no caffeine which can be helpful. When I did a tea ceremony demonstration at one of my school, a couple of the students could not drink matcha due to religious reasons. In that case, we substituted mugicha, so they could participate just like the other students. 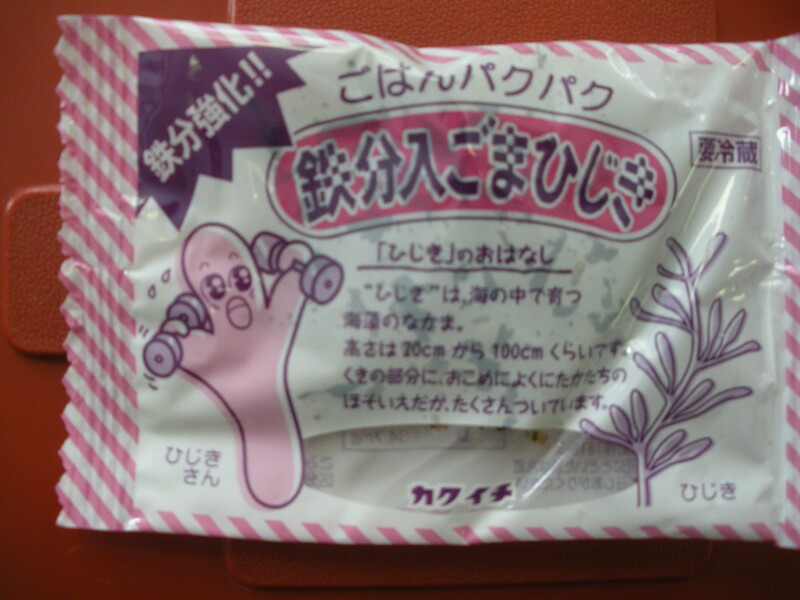 Picture of the adorable hijiki furikake we had a last month. Little Hijiki is so strong! Look at him lifting those weights! The backside of the package. 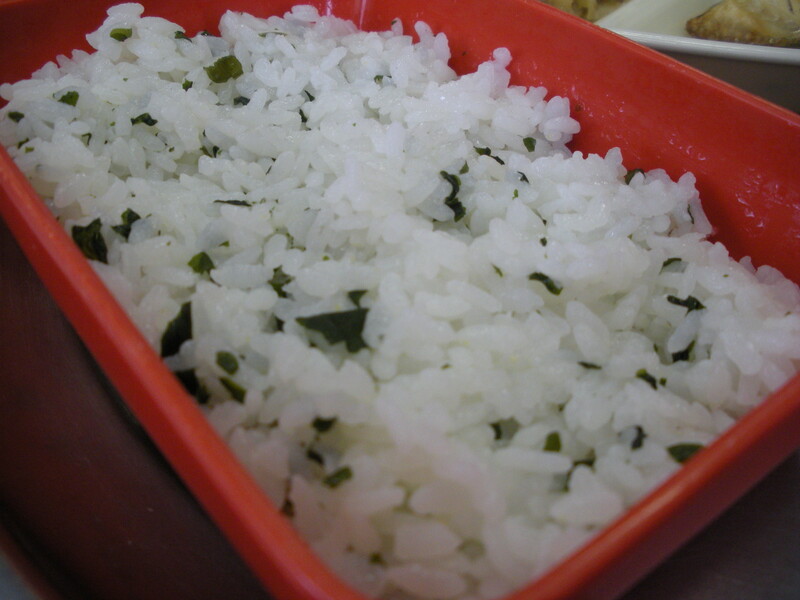 It informs us this hijiki furikake (that is, tsukudani) has lots of iron and is a traditional food of Japan. I can only conquer (concur?) with the greatness of this delicious sea plant! Shiitake that are dried in the sunlight become “Dried Shiitake”. When drying them in sunlight, their scent and flavour as well as their nutrition increases. Since they get all wrinkled up when drying, that is very strange. I am a little confused why kyuushoku dayori above talks about shiitake, since today’s dish didn’t seem to include any mushrooms, shiitake or otherwise. Although the soup broth may have been shiitake based? Anyway, the other day I was reading some of the papers posted in the classroom. It is common for each student to write their goals for the term at the beginning and then hang them all along the walls of the class. In this class room, the students each wrote two things they wanted to do (say good morning to fellow students, raise their test scores, etc.) and two things they wanted to avoid (forgetting things, bullying others etc.). One of the students wrote for the latter than he wanted to not catch a cold. Desiring food and drink or fine company, yielding to sickness, falling into idleness, or failing in willpower is the waning of bushido. This way of thinking is has its merits and faults. On the good side, we can control a lot more things in our life than we think, and this way of thinking encourages responsibility and industriousness. On the bad side, it puts a great deal of pressure on people for things that they might not be able to control and this can lead to suicide. I imagine the important thing is to still hold people responsible, but never forget to temper it with compassion. Potato Wrap is potato wrapped in a tea linen, flavored with butter, and steam baked in an egg cup. It is finished when it has a very simple and light taste. To be honest, I didn’t feel that today’s potato wrap was all the popular with the students at my school today. I of course didn’t have a problem with it but it did have bit of a ‘frozen food’ feel to it. However the kim chee was very popular, all the left overs being eaten. 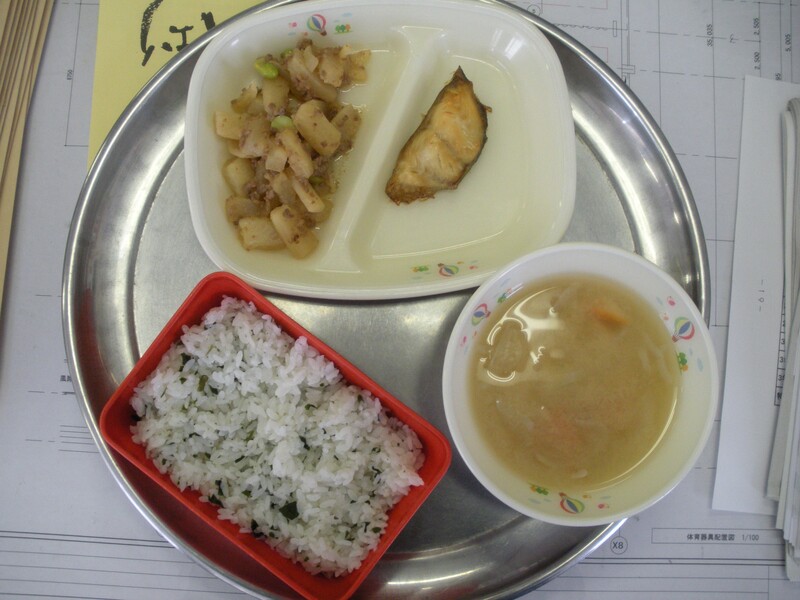 I can’t recall having daikon leaves in lunch before. This doesn’t mean we haven’t, since I on a whole do not have a good sense of time and thus memory, but at least we haven’t had them very often. 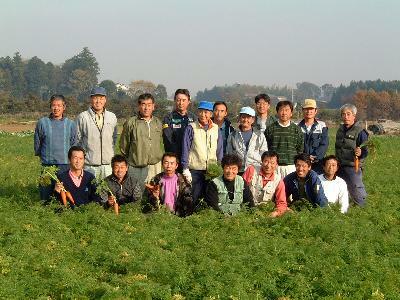 They tasted good though and it is nice to know that we are using more parts of the plant not just throwing out the perfectly good tops of the daikon radish. 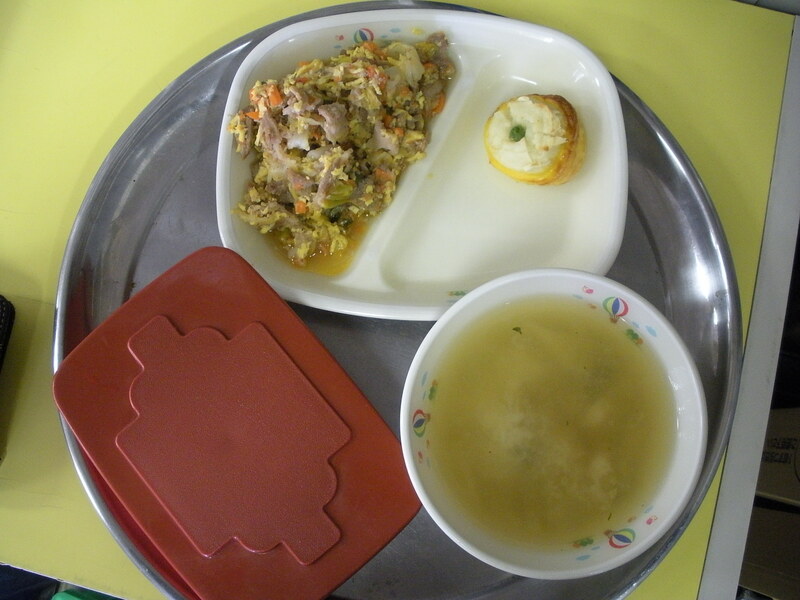 Today, I was thinking about the wasted food of school lunch left overs. At my small schools, the schools really make an effort to eat all of the food given. At the big schools, although there are campaigns to encourage students to eat everything on their plate, there is a fair amount of food that either remains unserved or is put back uneaten. The main issue I think is serving the correct amount of food to each school. I guess this is so difficult because the ‘correct’ amount varied depending on the person. 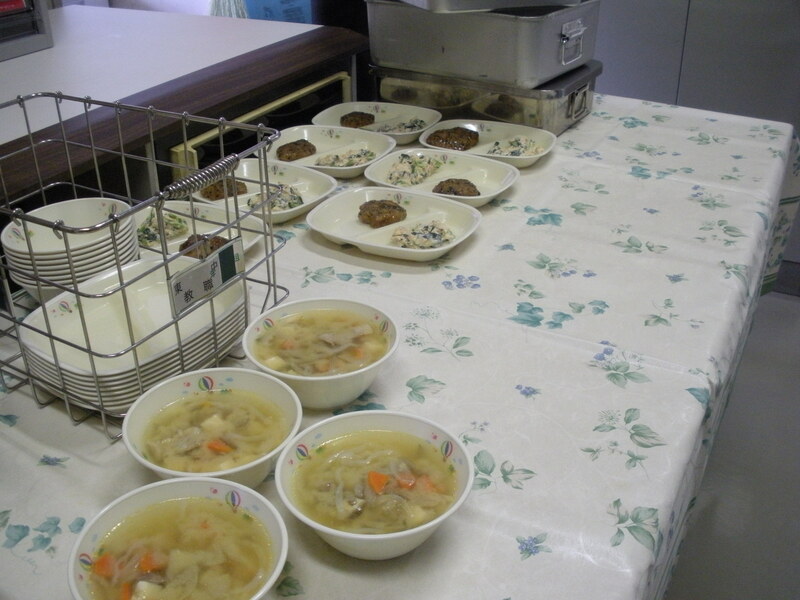 I often feel there is too much food served but another foreigner I work with feels there is not enough food served food. I have heard wildly varying opinions from Japanese teachers too. In the end though, I really feel like there should be a scientific way of resolving this problem. But we will never be able to make everyone satisfied. When meat was not eaten as much as it is today, ground foods were used as an ingredient in curry. Most representative of these are fish sausage and chikuwa. Having listened to the children of olden times, what do you think? I like chikuwa a lot, so I enjoyed today’s curry more than usual. Curry itself is a rather heavy dish I think, so using chikuwa rather than makes it a little light I feel. Not that it seems to have any less calories. Today’s salad was decent, but without much flavour. It was dressed in sesame and made of “western vegetables”, as broccoli etc. are sometimes advertised as here. As for the method for making “curry”, you should cut finely one stalk of green onion, half a ginger, and a little bit of garlic. Add 1 and a half gou water with one large spoon of ox bone added to it. Add chicken, shrimp, sea bream, oyster, or red frog and boil well. Then, put in one small spoon of “curry” flour and simmer for one Western hour. After it is well cooked, add salt and two large spoons of wheat flour to the water, so it is dissolved. 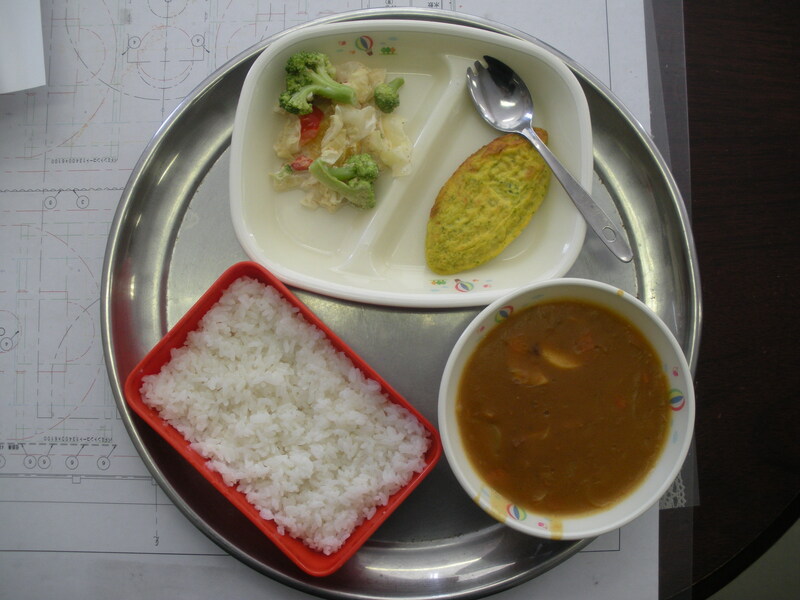 In Hokkaido for School Lunch Week, we are having “Let’s eat local curry!” So this year we’ve had Furano Omucurry twice! 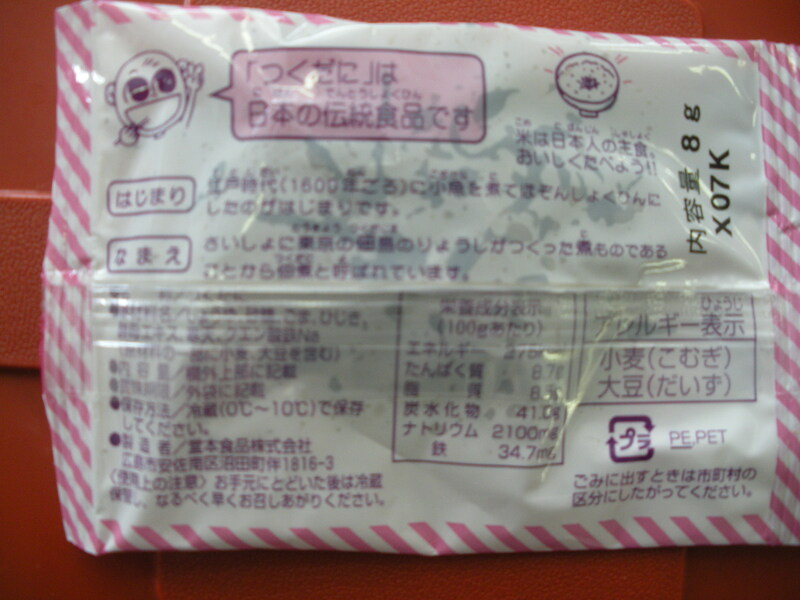 For dessert, we have a jelly made of Furano milk, an original dish from Furano School Lunch Centre. Today was an all day ski class, so I didn’t eat school lunch. But I just found out occasionally they can order school lunch even at the Board of Education! So I couldn’t eat school lunch, but at least I could take a lovely picture of it for you! School lunch began about 120 years ago. The menu in that time was “Riceball, Broiled Fish, and Pickles”. Today, we’ve tried to recreate that old style school lunch. 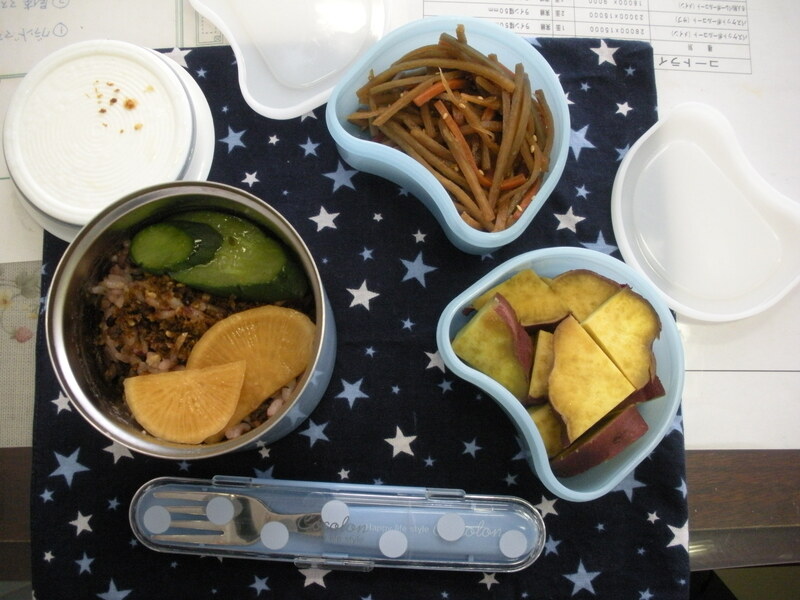 I really liked today’s lunch. It was filling without being oppressive, like most modern meals. In fact, if you cut the amount of rice and soup in half, today’s lunch would have been perfect more me. (Oh, and minus the milk, of course. 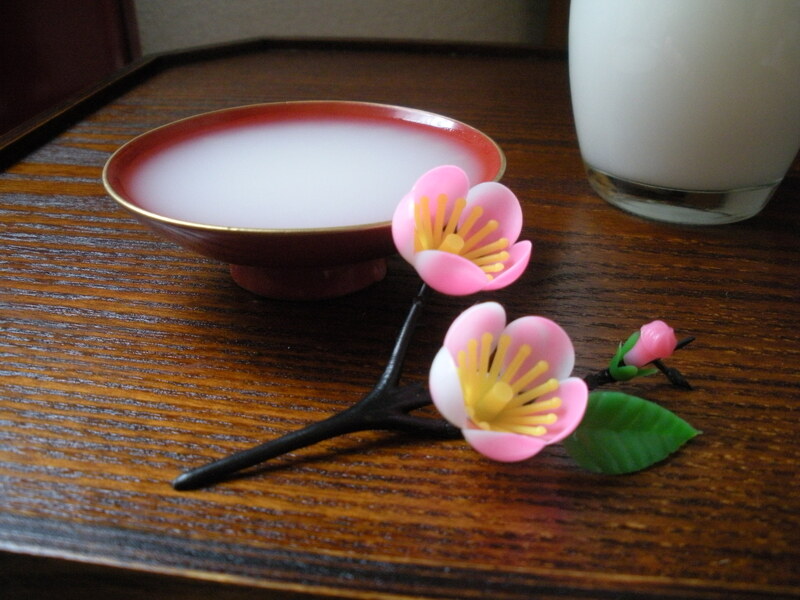 Tea or soymilk instead could be nice though.) Yummy! Yummy! That said, I think some of teachers who I ate lunch with today felt it was a little lackluster. 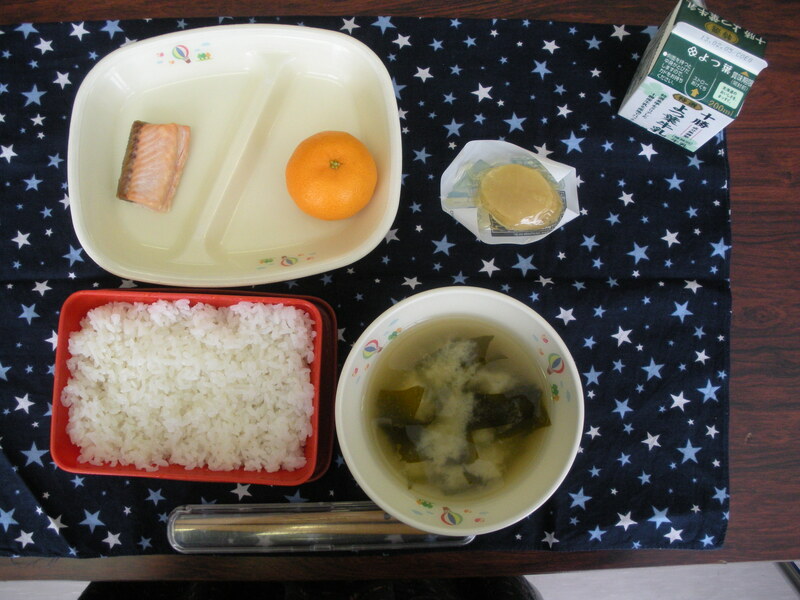 One of them commented that it was like “hospital food”, which I take was not really a compliment…? But even if most people felt that way, I still think its very important to experience and try to understand our past and where we came from. Bonus! 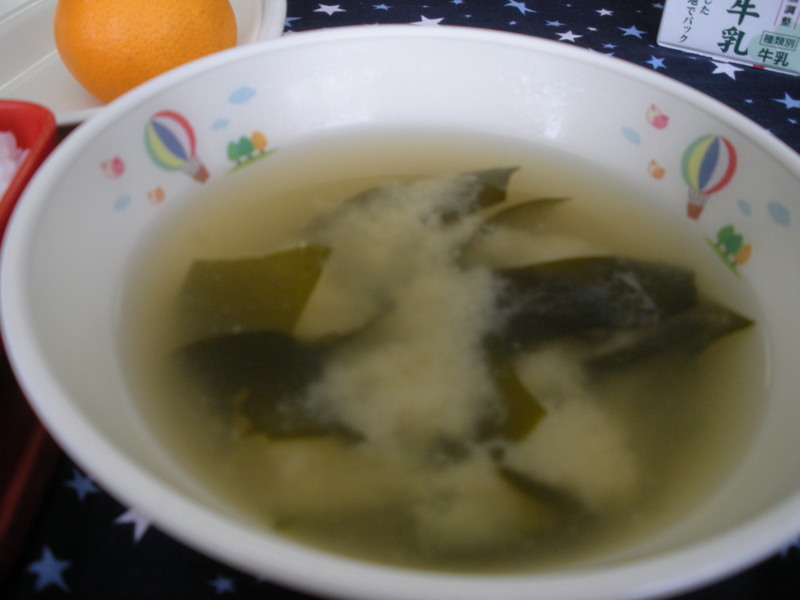 I just snapped this close up of the miso soup.